Leaf red coloration is an important characteristic in many plant species, including cultivars of ornamental peach (Prunus persica). Peach leaf color is controlled by a single Gr gene on linkage group 6, with a red allele dominant over the green allele. Here, we report the identification of a candidate gene of Gr in peach. The red coloration of peach leaves is due to accumulation of anthocyanin pigments, which is regulated at the transcriptional level. Based on transcriptome comparison between red- and green-colored leaves, an MYB transcription regulator PpMYB10.4 in the Gr interval was identified to regulate anthocyanin pigmentation in peach leaf. Transient expression of PpMYB10.4 in tobacco and peach leaves can induce anthocyain accumulation. Moreover, a functional MYB gene PpMYB10.2 on linkage group 3, which is homologous to PpMYB10.4, is also expressed in both red- and green-colored leaves, but plays no role in leaf red coloration. This suggests a complex mechanism underlying anthocyanin accumulation in peach leaf. In addition, PpMYB10.4 and other anthocyanin-activating MYB genes in Rosaceae responsible for anthocyanin accumulation in fruit are dated to a common ancestor about 70 million years ago (MYA). However, PpMYB10.4 has diverged from these anthocyanin-activating MYBs to generate a new gene family, which regulates anthocyanin accumulation in vegetative organs such as leaves. Activation of an ancient duplicated MYB gene PpMYB10.4 in the Gr interval on LG 6, which represents a novel branch of anthocyanin-activating MYB genes in Rosaceae, is able to activate leaf red coloration in peach. Peach [Prunus persica L. (Batsch)], a member of the Rosaceae family, is an important fruit tree crop worldwide. It is a diploid with a small genome size of ~ 230 Mb . Besides providing delicious fruit, peach trees are extensively used in ornamental plantings. In China, ornamental peach has been cultivated for landscape or patio plants for thousands of years. The color of flowers and leaves is one of the most attractive characteristics, which contribute to the ornamental value of plants . In peach, red color is caused mainly by the accumulation of anthocyanins. Anthocyanins are the largest group of water-soluble pigments in the plant kingdom and belong to the family of compounds known as flavonoids. Anthocyanins are stored in the central vacuole and responsible for the red, blue and purple colors in a wide range of plant tissues, including stems, leaves, roots, flowers, fruits and seeds ,. Anthocyanins are synthesized via flavonoid biosynthetic pathway and display a wide range of biological functions such as attracting pollinators and seed dispersers and protecting plants against attack by pathogenic organisms and UV radiation . In addition, anthocyanins have a beneficial role in human health because they exhibit a wide range of biological activities such as antioxidant, anti-inflammatory, antimicrobial and anti-cancer activities . Therefore, anthocyanins have long been the subject of investigation by botanists and plant physiologists. The conserved biosynthetic pathway of anthocyanins has been well established in ornamental plants such as petunia and snapdragon ,. The biosynthesis of anthocyanins begins with condensation of coumaroyl-CoA with malonyl-CoA to form naringenin chalcone by chalcone synthase (CHS). The chalcone is converted to naringenin by chalcone isomerase (CHI). Flavanone 3-hydroxylase (F3H) then catalyzes hydroxylation of naringenin to yield dihydrokaempferol (DHK). DHK can be further hydroxylated to produce dihydromyricetin (DHM) or dihydroquercetin (DHQ) by flavonoid 3′, 5′-hydroxylase (F3′5′H) or flavonoid 3′-hydroxylase (F3′H), respectively. DHK, DHM and DHQ are converted into anthocyanidins by dihydroflavonol reductase (DFR) and leucoanthocyanidin dioxygenase (LODX). Finally, anthocyanidin is glycosylated by UDP glucose: flavonoid 3-O-glucosyltransferase (UFGT) to generate anthocyanin. To date, anthocyanin pathway genes have been isolated and characterized in a variety of model plants such as petunia, snapdragon, and Arabidopsis . The anthocyanin pathway genes are regulated at the transcriptional level by three types of regulatory genes encoding R2R3 MYB, basic helix-loop-helix (bHLH) and WD40 proteins, respectively . These regulators interact with each other to form a MBW complex that binds to promoters and induces transcription of genes of the anthocyanin biosynthetic pathway. To date, molecular mechanisms underlying anthocyanin biosynthesis in fruits has been widely reported. For example, in grape two adjacent MYB transcription factors (TFs) VvMYBA1 and VvMYBA2 are responsible for the activation of UFGT gene, thus, have a regulatory effect on anthocyanin accumulation . Similarly, three transcription factors which appear to be allelic, MdMYB10, MdMYB1, and MdMYBA, have been isolated and characterized in apple -. In other Rosaceous fruits, such as pear, raspberry, strawberry and plum, homologues of MYB10 have been isolated . More recently, a MYB gene, designated Ruby, has been identified in citrus and its activation is responsible for the accumulation of anthocyanins in blood oranges . Besides fruit, anthocyanin accumulation in foliage is also a wide-spread phenomenon and the role of anthocyanins in senescing leaves has been investigated in temperate deciduous plants . However, there are few reports on the molecular mechanism underlying red coloration in ornamental trees or other deciduous trees. Peach leaf color is controlled by a single gene (Gr), with red allele dominant over green allele . Recently, the Gr locus has been mapped to the middle region of linkage group (LG) 6 . In peach, two MYB TFs have been reported to control anthocyanin coloration in fruit skin  and flower . Recently, a cluster of three MYBs, termed MYB10.1, MYB10.2 and MYB10.3, on the same genomic fragment where the Anther color (Ag) trait is located on linkage group 3, were implicated in regulating fruit anthocyanin biosynthesis . Here, we report the identification of a MYB TF in the Gr interval, which functions as a candidate Gr gene for leaf red coloration of ‘Hongyetao’, a popular ornamental peach cultivar in China. The distinctive features of this cultivar are its attractive red leaf coloration and pink-red flowers. The functionality of the peach MYB gene has been demonstrated via transient expression in both tobacco and peach. Our results add to the comprehensive understanding of the mechanisms underlying anthocyanin biosynthesis in peach. Anthocyanin contents were measured in different tissues of two cultivars Hongyetao (HYT) and Mantianhong (MTH) (Table 1). ‘HYT’ is an ornamental cultivar. It produces small brown-skinned fruits with white flesh and has purple-red leaves, red stems and pink-red flowers in the spring. However, the color of the leaves fades to green with maturity. The pink-red flower contains the highest level of anthocyanins, followed by the red leaf and stem, while the mature green-colored leaf and fruit accumulate little anthocyanin. ‘MTH’ has green leaves, red flowers, and white-fleshed fruits. The red flower contains high level of anthocyanins, while the anthocyanin content is very low in other tissues, including leaf, stem and fruit. In summary, anthocyanin accumulation in red-colored tissues is significantly higher than in non-red tissues, which is similar to previous reports that anthocyanin accumulation is responsible for red coloration in peach -. The Gr interval has been mapped to an interval flanked by two SSR markers BPPCT009 and CPDCT041 on LG6 . Comparison of primer sequences of the two SSR markers against the peach draft genome revealed that the Gr interval is about 7.9 Mb in physical size, ranging from 11.9 Mb to 19.8 Mb on LG6. To identify the candidate Gr gene, transcriptomes of young leaves from cv. HYT and MTH were sequenced using Illumina RNA-seq technology, yielding 16 and 11 million transcript reads, respectively. These reads were mapped onto the peach reference genome and the mapping result was deposited in NCBI SRA database with accession nos. SRX767357 and SRX796311. Gene expression level was estimated using FPKM (fragments per kilobase of exon per million fragments mapped) value and a threshold of 1.5 times fold-change was used to separate the genes differentially and non-differentially expressed. Of the 129 genes in the Gr interval, 18 genes were identified to be differentially expressed between red- and green-colored leaves (Table 2). Of these genes, only one (ppa018744m) encoding a transcription factor homologous to Arabidopsis AtMYB113 is related to anthocyanin biosynthesis. The gene, designated PpMYB10.4, showed 239.5 times higher level of expression in red-colored leaves than in green-colored leaves. Besides the PpMYB10.4 gene, another AtMYB113 homologue outside the Gr interval on LG3, termed PpMYB10.2 , was identified in the peach leaf transcriptome. However, its expression level was 0.3-fold lower in red-colored leaves than in green-colored leaves. *The candidate gene in the Gr locus is indicated in bold. Subsequently, we checked the expression levels of anthocyanin structural genes and found PpCHS, PpCHI, PpF3H, PpF3′H, PpDFR, and PpLDOX showed 1.5-, 1.6-, 2.1-, 2.7-, 4.5-, and 4.9-fold higher levels of expression, respectively, in red-colored leaves than in green-colored leaves. PpUFGT was highly expressed in red leaves, whereas, its transcript was almost undetectable in green leaves. This demonstrates that accumulation of anthocyanin in peach leaf is regulated at the transcriptional level. Since anthocyanin biosynthesis is regulated by the MBW complex , we also investigated anthocyanin-related bHLH and WD40 TFs in the peach leaf transcriptome. 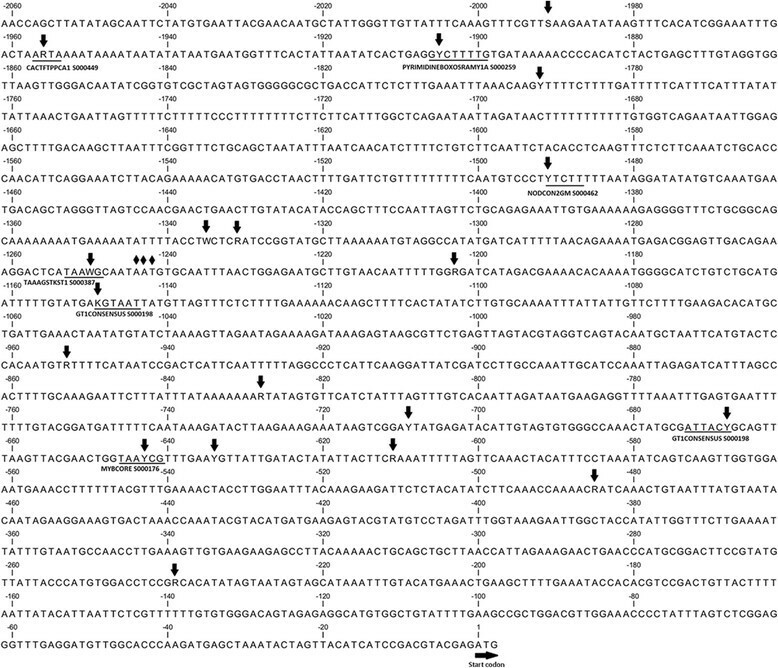 Two homologues of AtGL3 (PpbHLH3 and PpbHLH33) and two homologues of AtTTG1 (PpWD40A1 and PpWD40A2) were identified. PpbHLH3 and PpbHLH33 had 0.6- and 0.1-fold higher levels of expression level, respectively, in red leaves than in green leaves. In contrast, PpWD40A1 and PpWD40A2 had 0.3 and 0.1-fold lower levels of expression, respectively, in red leaves than in green leaves. Taken together, all the results suggest that PpMYB10.4 is the candidate gene for the Gr locus. To determinate whether multiple MYB genes are involved in the regulation of anthocyanin accumulation in peach leaves, we compared the cDNA sequences of PpMYB10.2 and PpMYB10.4 against the draft genome of peach cv. Lovell using blastn . As a result, PpMYB10.2 and its two paralogs, termed PpMYB10.1 and PpMYB10.3 , were located next to each other within a 72 kb region on chromosome 3, while PpMYB10.4 and its two paralogs (PpMYB10.5 and PpMYB10.6) were clustered within a 63 kb region on chromosome 6 (Figure 1A). Accession numbers of PpMYB10.1 to PpMYB10.6 at the Genome Database for Rosaceae (GDR, http://www.rosaceae.org/) were listed in Additional file 1: Table S1. PpMYB10.2 was identical in sequence to PpMYB10 previously isolated from peach fruit . PpMYB10.3 and PpMYB10.1 have recently been implicated in peach fruit pigmentation . All the six MYB TFs consist of three exons separated by two introns. The consensus sequences, GC and AG, were found at the 5′ and 3′-borders of the two introns of PpMYB10.1 to PpMYB10.3, strictly following the “GT–AG” splicing site of the eukaryotic introns proposed by Breathnach and Chambon . In contrast, “GT–AG” and “GC-AG” splicing sites were observed for the first and second introns of PpMYB10.4 to PpMYB10.6, respectively. Six anthocyanin-related MYB genes in the peach genome. A, Structural feature and chromosomal position of the six peach MYB genes. B, Estimated divergence time between anthocyanin-related MYB genes in plants based on aligned nucleotide sequences using Bayesian MCMC analysis. The GenBank accession numbers are as follows: Prunus domestica PdMYB10 (ABX71492); Malus × domestica MdMYB10 (AFC88038), MdMYB110a (JN711473), and MdMYB110b (JN711474); Pyrus communis PyMYB10 (JX403957); Cydonia oblonga CoMYB10 (EU153571); Citrus sinensis CsRuby (AFB73909); Vitis vinifera VvMYB1a (ABB87014); Ipomoea batatas IbMYB1 (BAF45114); Arabidopsis AtPAP1 (NP_176057), AtPAP2 (NP_176813), AtMYB11 (NP_191820), and AtMYB113 (NP_176811); Antirrhinum majus AmRosea1 (ABB83826), Zea mays ZmC1 (NM_001112540); and Oryza sativa OsC1 (HQ379703). Pm001924 and MDP0000573302 are extracted from the released genome sequences of Prunus mume  and apple, respectively. The evolutionary history assay revealed that the ancestral MYB gene at early stages of Rosaceae have undergone a duplication, ~ 70 million years ago (MYA), to generate the two gene families, designated MYBIand MYBII (Figure 1B). MYBI consists of PpMYB10.1 to PpMYB10.3 and their homologues such as MdMYB10 , MdMYB110a  in Malus and PyMYB10  in Pyrus and PdMYB10 in Prunus domestica, while MYBII contains PpMYB10.4 to PpMYB10.6 and their homologues such as PmMYB gene in Prunus mume . To validate the RNA-seq-based gene expression profiles, the expression level of anthocyanin biosynthesis genes was examined in leaves of cv. HYT and MTH using qRT-PCR. All the biosynthetic pathway genes, including CHI, CHS, DFR, F3′H, F3H, LDOX, and UFGT, showed significantly higher level of expression in red leaves than in green leaves (Figure 2). For regulator genes, the PpbHLH and PpWD40 genes were expressed in leaves, but showed no difference in expression level between red- and green variants (Figure 3). Of the six MYB genes, four (i.e. PpMYB10.1, PpMYB10.3, PpMYB10.5, and PpMYB10.6) showed extremely low expression in both red- and green- leaves. PpMYB10.2 gene was expressed in leaves, but showed no difference in expression level between red- and green-colored leaves. In contrast, the expression level of PpMYB10.4 gene in red- leaves was significantly higher than those in green- leaves. Expression levels of anthocyanin pathway genes in red- or green-colored leaves of different cultivars grown in spring season. The black, grey, and white boxes represent young leaf of cv. HYT, mature leaf of cv. HYT, and young leaf of cv. MTH, respectively. Expression profiles of anthocyanin regulatory genes in spring season leaves of two peach cultivars. The black, grey, and white boxes represent red-colored young leaves of cv. HYT, green-colored mature leaves of cv. HYT, and green-colored young leaves of cv. MTH, respectively. In addition, the expression profile of PpMYB10.4 gene was also examined in leaves at different developmental stages and a second green foliage cultivar ‘Baihuabitao’ was included in the qRT-PCR analysis (Figure 4). The expression levels of PpMYB10.4 gene were significantly higher in young leaves of cv. Hongyetao than those in mature leaves in all three seasons, including spring, summer and autumn. However, the expression levels of PpMYB10.4 gene were very low in both young and mature leaves of cvs. Baihuabitao and Mantianhong. The result of qRT-PCR is consistent with that of RNA-seq-based gene expression profiling, which confirms that activation of PpMYB10.4 gene in red leaves. Expression levels of PpMYB10 . 4 gene in different colored leaves of peach. R1, young leaves of cv. HYT in spring; M1, mature leaves of cv. HYT in late spring; R2, young leaves of cv. HYT in summer; M2, mature leaves of cv. HYT in summer; R3, young leaves of cv. HYT in autumn; M3, mature leaves of cv. HYT in autumn; G1-1, young leaves of cv. MTH in spring, G1-2, mature leaves of cv. MTH in spring; G2-1, young leaves of cv. Baihuabitao in spring; G2-2, mature leaves of cv. Baihuabitao in spring. The black and grey boxes indicate red- and green-colored leaves, respectively. Transcriptional activity of PpMYB10.4 was initially tested using a tobacco transient colour assay. PpMYB10.4 and bHLH3 were syringe-infiltrated into the underside of expanding Nicotiana tabacum leaves. No pigmentation was observed at infiltration sites 7 days after transformation with PpbHLH3 (Figure 5A), while a slight pigmentation was observed with infiltration of PpMYB10.4 (Figure 5B). An intense pigmentation was detected at infiltration sites 7 days after transformation with both PpMYB10.4 and PpbHLH3 (Figure 5C). Transient expression of peach PpMYB10 . 4 gene in tobacco leaf. A, B, and C indicate infiltration sites 7 days after transformation with PpbHLH3, PpMYB10.4, and PpMYB10.4/PpbHLH3, respectively. The functionality of PpMYB10.4 was further validated by particle bombardment-mediated transient expression in green-colored young leaves of cv. MTH. The leaves turned red 2 days after transformation with PpMYB10.4, but the leaves transformed with empty vector (EV) were still green in color (Figure 6A). Anthocyanin extraction results showed that the peach leaves transformed with PpMYB10.4 contained anthocyanin, but not for the EV-transformed leaves (Figure 6B). 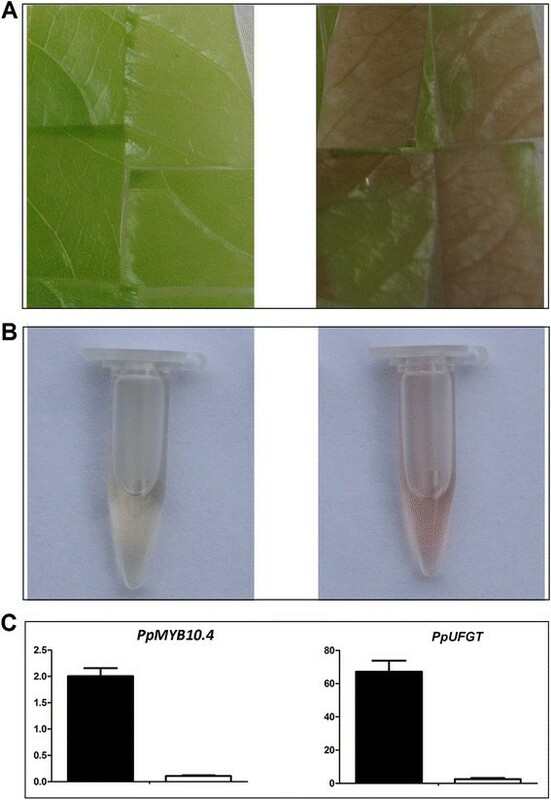 Moreover, PpMYB10.4 was highly expressed in leaves transformed with PpMYB10.4, while its transcript level was extremely low in leaves transformed with EV (Figure 6C). Likewise, PpUFGT showed over 30 times higher expression level in leaves transformed with PpMYB10.4 than in leaves transformed with EV. Functional analysis of peach PpMYB10 . 4 using transient expression assay. A, Transient expression of PpMYB10.4 gene (right) together with an empty vector as control (left) in young leaf of cv. Mantianhong. B, Extraction of anthocyanins. C, Expression levels of PpMYB10.4 and PpUFGT in peach leaves transformed with PpMYB10.4 (black box) and empty vector (white box), respectively. It has previously been shown the apple MYB10 can regulate is own expression . A dual luciferase assay was conducted to clarify if the expression of PpMYB10.4 is auto-regulated or can be regulated by, for example, PpMYB10.2. However, no interaction was detected between PpMYB10.2 and the promoter of PpMYB10.4, and PpMYB10.4 had no influence on its own expression in this transient assay (Figure 7). Analysis of the effect of peach MYB genes on the activation of the promoter of PpMYB10 . 4 in red foliage cv. Hongyetao. Agrobacterium carrying a 35S:Gus plasmid is used as a negative control. Error bars are SE for 4 replicate reactions. While there are differences in the expression profile of PpMYB10.4 between red- and green-colored leaves, the coding sequences of PpMYB10.4 are identical between cv. HTY and MTH. Hence, a pair of primers 5′-GGATCTCGCCGCTGTTTCTG-3′ and 5′-TCTCACTCCCGAAGAACTATCCAT-3′ was designed to amplify the promoter genomic regions of PpMYB10.4 in cv. HTY and MTH. The promoter sequences of PpMYB10.4 from cvs. HTY, MTH, and Lovell were aligned and 18 single nucleotide polymorphisms (SNPs) and a 3-bp indel were identified within a 2.06-kb region upstream the PpMYB10.4 start codon (Figure 8). Of these SNPs, seven were located within potential motifs, which were identified using the PLACE program . Among these motifs, one MYBCORE is a potential binding site for MYB-type anthocyanin regulators. However, the T/G SNP in the MYBCORE site is found in the promoter of both ‘HYT’ and ‘MTH’, suggesting that it is not causative for the red leaf coloration. There was a 3-bp insertion found in the promoter of cv. HYT, and the 3-bp indel site was polymorphic. However, the 3-bp insertion was not found in the promoter of cv. MTH and Lovell. To test if the 3-bp indel is related to the red leaf coloration, a pair of primers flanking the 3-bp indel (5′-TTTTACCTTCTCGATCCGGTAT-3′ and 5′-AATTGTTACAAGCATTCTCCAGTT-3′) was then designed to amplify products in diverse peach cultivars, including ‘Datuanmilu’, ‘Gangshanbai’, ‘Huyou002’, ‘Jinyuan’, ‘May Fire’, ‘Nanfangzaohong’, ‘Ruiguangmeiyu’, ‘Wuyuexian’, ‘Xizhuangyihao’, and ‘Zhaoxia’. All these cultivars have green-colored leaves. However, the 3-bp insertion was also found in the promoter of four cultivars, Huyou002, Nanfangzaohong, Xizhuangyihao, and Zhaoxia. This suggests the indel is unlikely to be responsible for leaf red coloration in peach. Nucleotide sequence of the promoter region of PpMYB10 . 4 . The positions of SNPs and one 3-bp insertion-deletion are indicated with black arrows and diamond, respectively, while cis-regulatory motifs are highlighted with underlines. We also identified repetitive elements in the promoter sequences of PpMYB10.4 using the program RepeatMasker (http://www.repeatmasker.org/). One transposon-like fragment 280 bp in size was found to be located 692 bp upstream of the ATG translation start codon. However, the transposon-like fragment is almost identical in nucleotide sequence between HTY and MTH. This suggests that this transposable element is unlikely to be responsible for activation of PpMYB10.4. In many plant species, anthocyanin accumulation is controlled primarily via transcriptional regulation by R2R3 MYB transcription factors . Here, an R2R3 anthocyanin-activating MYB gene PpMYB10.4, which located in the Gr interval, is shown to be the candidate Gr gene for red leaf coloration in peach. Moreover, our study reveals that the PpMYB10.4 homologue PpMYB10.2 is also expressed in peach leaf. Previous study has demonstrated that PpMYB10.2 is a functional gene responsible for anthocyanin pigmentation in peach skin ,. However, the PpMYB10.2 expression alone is unlikely to induce anthocyanin pigmentation in the peach leaf. 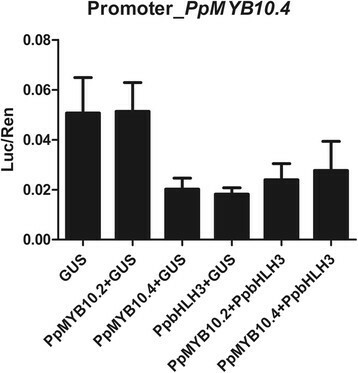 Firstly, PpMYB10.2 has no effect on the induction of the PpMYB10.4 expression. Also, PpMYB10.2 has similar or lower levels of expression in red leaves than green leaves. Transcriptome analysis revealed that two homologues (ppa019522m and ppa010846m) of AtMYBL2, a negative regulator of anthocyanin biosynthesis in Arabidopsis, are expressed in leaf. These MYB repressors may compete with MYB activators for binding sites of bHLH and/or anthocyanin structural genes such as DFR . Both ppa019522m and ppa010846m are expressed at higher level in red-colored leaf than in green-colored leaf. Therefore, it seems that anthocyanin accumulation in peach leaf is likely coordinatively regulated by both positive and negative regulators of anthocyanin biosynthesis. The R2R3 MYB TFs are functionally conserved in plants, but may activate distinct sets of structural anthocyanin genes . Structural anthocyanin genes can be divided into two groups, early biosynthetic genes (EBGs, i.e. CHS, CHI, F3H, and F3′H) and late biosynthetic genes (LBGs, i.e. DFR, LDOX, and UFGT) . In Arabidopsis, PAP1, PAP2, MYB113 and MYB114 control anthocyanin accumulation through regulation of LBGs . Similarly, two MYB genes in grapevine, VvMYBA1 and VvMYBA2, increase anthocyanin biosynthesis in berry through activation of UFGT . In contrast, apple MdMYB10 activates all genes of the anthocyanin biosynthetic pathway, leading to anthocyanin pigmentation in fruit, stem and foliage . In cauliflower, BoMYB2 specifically activates both regulatory gene BobHLH1 and structural genes of late anthocyanin pathway, including BoF3′H, BoDFR, and BoLDOX . In this study, the entire set of anthocyanin pathway genes show higher level of expression in red leaves than in green leaves. This indicates that anthocyanin accumulation in peach leaf is regulated at transcriptional level, and PpMYB10.4, like the apple MYB10, may directly or indirectly activate both EBGs and LBGs. On the other hand, transient color assay reveals that the peach PpMYB10.4, like the apple MdMYB10, interacts with bHLH3 to induce anthocyanin biosynthesis . Previous studies show that the MBW complexes mainly activate LBGs ,. This is also true in our case of the peach transient assay, which shows PpMYB10.4, like the grapevine VvMYBA genes, increases anthocyanin accumulation in leaves through activation of UFGT. Gene duplication has frequently occurred in the evolutionary development of anthocyanin-activating MYB genes. For example, multiple clustered MYB genes have been reported in grapevine  and cauliflower . In this study, two clusters of three anthocyanin regulatory MYB genes in peach have been identified on LGs 3 and 6. The chromosome regions covering these two clusters are not derived from the same ancestral paleochromososme of the eudicot paleoancestor . In apple, two anthocyanin regulatory genes MYB110a and MYB110b are also clustered in a 60 kb region on chromosome 17 , and appear to be related to MYB10 on the homologous chromosome 9. However, we have not found any clusters of anthocyanin-activating MYB genes in the strawberry genome . The genomes of Fragaria, Malus and Prunus are derived by reconstruction of a hypothetical ancestral Rosaceae genome that had nine chromosomes . Thus, it is likely that the clusters of anthocyanin-activating MYB genes have evolved after the divergence of peach from other Rosaceae species. As mentioned above, anthocyanin-activating MYB genes in Rosaceae can be divided into two families MYBI and MYBII. Interestingly, the MYBI family is composed of previously reported MYB genes that are mainly responsible for anthocyanin accumulation in fruits. For example, the apple MdMYB110a contributes to anthocyanin accumulation in fruit cortex late in maturity . Likewise, the peach PpMYB10.1/2/3 is involved in anthocaynin accumulation in fruit ,. Two alleles of the MdMYB10 locus MdMYBA and MdMYB1 control red coloration of apple skin although MdMYB10 is able to induce anthocyanin pigmentation in both fruit (skin and cortex) and foliage due to its constitutive over-expression profile ,. In contrast, the peach PpMYB10.4 regulates anthocyanin pigmentation in vegetative organs such as leaves, but not in fruit as ‘HYT’ accumulates no anthocyanins in the fruit. The coding sequences of PpMYB10.4 was aligned the genome sequence databases of apple and P. mume using blastn, and two genes MDP0000573302 and Pm001924 from apple and P. mume, respectively, are found to have the highest level of similarity to PpMYB10.4. 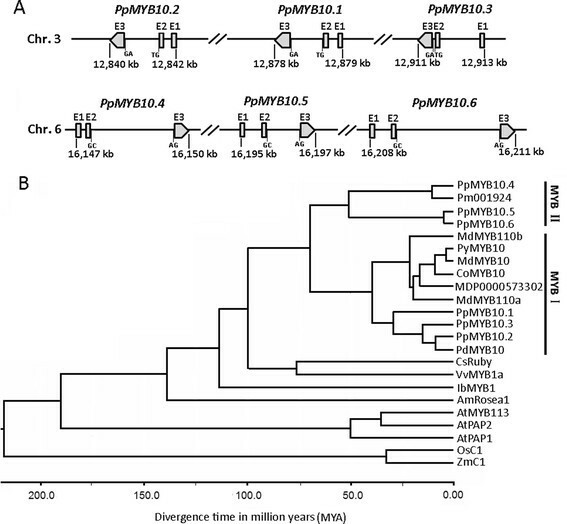 PpMYB10.4 and its ortholog Pm001924 are diverged from previously reported anthocyanin-activating MYB genes in Rosaceae to generate a new gene family MYB II. However, MDP0000573302 is grouped into the MYBI family. Our study shows that MYBI and MYB II genes can be traced to a common ancestor about 70 MYA. The most recent common ancestor of Malus and Prunus has been dated to 49.42 ± 0.54 MYA , and peach has not undergone recent whole-genome duplication . Thus, the two MYB clusters in the peach genome are likely derived from the hypothetical ancestral Rosaceae genome, whereas, the ortholog of PpMYB10.4 may have been lost in the apple genome after the divergence of apple from peach. Our study indicates that both PpMYB10.5 and PpMYB10.6 are not expressed in peach leaf. Their transcripts are not identified in our previously reported transcriptomes of peach flower and fruit tissues . It has been reported that a siRNA, TAS4-siRNA81(−), targets a set of MYB TFs such as PAP1 and MYB113 in Arabidopsis . A consensus target sequence (5′-GGCCTCAACCACGAACCTTCT-3′) for TAS4-siRNA81(−) is also found in the third exon of both PpMYB10.5 and PpMYB10.6. This may be responsible for the finding that PpMYB10.5 and PpMYB10.6 are not expressed in any tested tissues of peach. In contrast, PpMYB10.4 contain no target sites for TAS4-siRNA81(−), and its expression is highly induced in red leaves. Several SNPs are found in the promoter region of PpMYB10.4. In apple, a SNP 1,661 upstream of the ATG translation start codon of MYB1 has been reported to co-segregate with red skin color . Thus, it is not yet clear if the activation of PpMYB10.4 gene could be attributed to single nucleotide mutation in promoter region. In addition, a reciprocal translocation is found between linkage groups 6 and 8 in the F2 of an interspecific cross between ‘Garfi’ almond and ‘Nemared’ peach, and the translocation breakpoint is located in the vicinity of the Gr locus . This translocation is also found in the F2 of a cross between two peach cultivars ‘Akame’ and ‘Juseitou’ . Since ‘Nemared’ and ‘Akame’ are both red-leaved cultivars, it is worthy of further study to ascertain the relationship between this translocation and peach leaf coloration. Peach is a member of a group of temperate deciduous fruit trees, many of which produce green leaves and accumulate anthocyanin during the process of senescence in autumn . The anthocyanin pigmentation provides effective photo-protection during the critical period of foliar nutrient re-absorption. In contrast, the young expanding leaves of ornamental peach ‘HYT’ are red, but the color of leaves fades to green as they mature. This change in leaf color is attributed to decreased expression of PpMYB10.4. Temperature is an important factor that affects anthocyanin biosynthesis in plants , which in apple is via expression of MYB10 . However, PpMYB10.4 shows no significant difference in expression level between young red leaves grown in different seasons, including spring, summer and autumn (in the high temperatures of Wuhan, China). This is similar to a previous report that the anthocyanin biosynthetic genes have not been strongly down-regulated in grape berry grown at high temperature . Moreover, the anthocyanin contents are also similar between young red leaves grown in different seasons, which is different from the finding that high temperature increases anthocyanin degradation in grape skin . It has been reported that light and hormones play also an important role in anthocyanin biosynthesis ,. Thus, other factors, besides temperature may be responsible for the decreased expression of PpMYB10.4. Further studies are needed to clarify what factors play a role in down-regulation of PpMYB10.4 expression in mature leaves, resulting in the peach leaf color change. There are two clusters encoding anthocyanin-activating MYB genes in the peach genome, with one gene PpMYB10.4 in the Gr interval on LG 6 being responsible for anthocyanin accumulation in peach leaves. Anthocyanin-activating MYB genes in Rosaceae can be divided into two families MYBI and MYBII, which arise from an ancient duplication about 70 MYA. MYBI family is mainly responsible for anthocyanin accumulation in fruits, while MYB II family regulates anthocyanin accumulation in vegetative organs such as leaves. All peach cultivars used in this study are maintained at Wuhan Botanical Garden of the Chinese Academy of Sciences (Wuhan, Hubei province, PRC). A red-leaved cultivar ‘Honyetao’ together with two green-leaved cultivars ‘Baihuabitao’ and ‘Mantianhong’ were selected for quantitative RT-PCR analysis (qRT-PCR) to identify gene responsible for anthocyanin pigmentation in leaves. For cv. ‘Hongyetao’, juvenile and mature leaves were sampled in three different seasons, including spring, summer, and autumn, whereas, the leaves of other cultivars were collected in spring. All samples were immediately frozen in liquid nitrogen, and then stored at −75°C until use. Anthocyanin content was assayed following the protocol described by previous study . Briefly, approximately 1 g of tissue was ground to fine powder in liquid nitrogen, and extracted with 5 ml extraction solution (0.05% HCl in methanol) at 4°C for 12 h. After centrifugation at 10,000 g for 20 min, the supernatant was transferred into a clean tube. The sediments were extracted with additional 5 ml extraction solution at 4°C for 6 h. The supernatants were combined and the final volume was measured. Then, 1 ml supernatant was mixed with 4 ml of buffer A (0.4 M KCl, adjusted to pH 1.0 with HCl) or buffer B (1.2 N citric acid, adjusted to pH 4.5 with NaH2PO4 and NaOH). Absorbance of the mixture was measured at 510 and 700 nm. The anthocyanin content was calculated using the following formula: TA = A * MW * 5 * 100 * V/e, where TA stands for total anthocyanin content as cyanidin-3-O-glucose equivalent (mg/100 g), V for final volume (ml), and A = [(A510 - A700) at pH1.0] - [(A510 - A700) at pH 4.5], e is absorbance of cyanindin-3-glucoside (26,900), MW is molecular weight of cyanindin-3-glucoside (449.2). Three measurements for each biological replicate sample were performed. Total RNA was extracted using the Trizol reagent, followed by RNA cleanup using RNase-free DNaseI (Takara, Dalian, China). PolyA mRNAs were purified using oligo-dT-attached magnetic beads. The purified mRNAs were cleaved into small pieces (200 ~ 500 bp) by super sonication. Cleaved mRNAs were used as templates to construct RNA-Seq library according to our previously reported protocol . The constructed libraries were purified by the AMPure beads, and recovered from the low melting agarose (2%) at the length of about 300 base-pair by the Qiagen Nucleic acid purification kits (Qiagen, CA, USA). Transcriptome sequencing was conducted using Illumina Hiseq2000 sequencer. Total RNA was isolated using Universal Plant Total RNA Extraction Kit (BioTeke, Beijing, China) according to the manufacturer’s instructions. The RNA samples were treated with DNase I (Takara, Dalian, China) to remove any contamination of genomic DNA. Three micrograms of total RNA per sample was subjected to cDNA synthesis using Superscript III reverse transcriptase (Invitrogen). A SYBR green-based real-time PCR assay was carried out in a total volume of 25 μL reaction mixture containing 12.5 μL of 2× SYBR Green I Master Mix (Takara, Dalian, China), 0.2 μM of each primer, and 100 ng of template cDNA. Peach gene PpTEF2 with GenBank accession no. JQ732180 was used as constitutive controls for expression profile analysis of genes. Primer sequences of structural genes related to anthocyanin pathway were the same as reported in our previous study . It is worth noting that four CHS genes in peach share high levels of nucleotide sequence identities (94 to 97%) in the coding regions, and their collective expression was investigated using a pair of primers designed from conserved regions. Primer sequences of anthocyanin regulatory genes in peach and anthocyanin structural genes are listed in Additional file 1: Table S1. Amplifications were performed using Applied Biosystems 7500 Real-Time PCR System. The amplification program consisted of 1 cycle of 95°C for 10 min, followed by 40 cycles of 95°C for 30 sec, and 60°C for 30 sec. The fluorescent product was detected at the second step of each cycle. Melting curve analysis was performed at the end of 40 cycles to ensure proper amplification of target fragments. Fluorescence readings were consecutively collected during the melting process from 60 to 90°C at the heating rate of 0.5°C/sec. All analyses were repeated three times using three biological replicates. The estimation of divergence time of MYB genes was conducted according to our previous reported method . Briefly, the coding DNA sequences were aligned using MUSCLE (multiple sequence comparison by log-expectation)  and integrated in MEGA5. The molecular clock was calibrated using two calibration points; divergence of rice-maize (31.0 ± 6.0 MYA) as well as that of monocot-dicot (250.0 ± 40.0 MYA). This calibration served as landmarks to assess the posterior distribution of estimated divergence time points among all samples used. A Bayesian Markov chain Monte Carlo (MCMC) analysis was performed to estimate the divergence dates , and the analysis included four independent runs, each with 10 million MCMC steps, and sampled every 1000 generations. Two pairs of primers, 5′-CACCATGGATAGTTCTTCGGGAGTGA-3′/5′-GTTATGTTGATAGATTCCAAAGGTC-3′, and 5′-CACCATGGCTGCACCGCCAAGT-3′/5′-CTAGGAATCAGATTGGGGAATTATT-3′ were designed to amplify the coding sequences of PpMYB10.4 and PpbHLH3, respectively, using cDNA templates from young leaves of cv. Hongyetao. The coding sequences were individually inserted into pHEX2 vector under the control of 35S promoter using the LR Clonase II Kit (Invitrogen). A pHEX2 vector containing a GUS gene was used as a control for dual luciferase assay. DNA fragment ~ 2.3 kb in size upstream of start codon of PpMYB10.4 was cloned from cv. Hongyetao using a pair of primers (5′-GGATCTCGCCGCTGTTTCTG-3′/5′-CTCGTACGTCGGATGATGTAACTAGT-3′). The DNA fragment was subsequently inserted into multi cloning site of pGreenII 0800–LUC+ vector, which contains a reporter cassette . Dual luciferase assay was carried out use the same protocol as described by previous study . Two-week-old seedlings of Nicotiana tabacum grown in greenhouse were used for infiltration. Agrobacterium strain GV3101 was selected for transient color assay. Separate strains containing PpMYB10.4 or PpbHLH3 fused to 35S promoter in the pHEX2 vector were infiltrated or co-infiltrated into the abaxial leaf surface. Each infiltration was performed using three leaves for the same plants. The photographs were taken 7 days after infiltration. The construct containing PpMYB10.4 as mentioned above was introduced into young leaf of cv. MTH using the bombardment method as previously reported . Briefly, peach donor material was sterilized young leaves treated by sodium hypochlorite solution. After disinfection, leaves were cut into squares with 1 cm diameter and precultured on MS medium for 24 h. Sub-micron gold particles (0.6 μm) were treated according to the manufacturer’s manual. DNA-coated gold particles are delivered using the PDS-1000/He particle gun (BIO-RAD) according to the manufacturer’s instructions. An empty vector was also transformed as a control. After bombardment, the peach leaves were cultured on MS for 2 days, and cultured media were kept in a growth chamber at 22°C and 50% to 80% relative humidity. The transformed peach leaves were collected, finely ground in liquid nitrogen, and then subjected to both anthocyanin and RNA extraction. RNA extraction was conducted using the protocol as mentioned above, while anthocyanins were extracted in 1% (v/v) HCl-methanol solution at room temperature and shaken continuously overnight. The extract was centrifuged at 10,000 g for 15 min and the chlorophyll was removed by adding chloroform. The supernatant containing anthocyanins was collected. YZ and SV participated in gene expression and transgenic analysis. LW and HZ analyzed the transcriptome data. HZ, KL, RE, and AA participated in gene functional studies. YH was overall project leader. All authors read and approved the final manuscript. Ying Zhou, Hui Zhou contributed equally to this work. This project was supported by funds received from the National 863 program of China (No. 2011AA100206) and the National Natural Science Foundation of China (No. 31101533).